December 2017 we will open the doors of our modern KWT Lodge in the mountain village Baad. Until that time, we will be busy with the refurbishment of the present hotel. A large section of the building will be renovated (interior and exterior) and the current rooms will get a modern update. The lodge has ten double-rooms and two apartments which have a modern but cozy feeling. The lodge is situated in the idyllic village of Baad and has a beautiful view into the mountains. Multiple walking trails, tour ski- and Nordic skiing routes start from Baad. A free ski-bus (the stop is a 100 meters away) takes you to the nearest ski lift in only 5 minutes. Busses depart every ten minutes. The lodge has a large communal space where you can relax and have a drink around the fire place after an active outdoor day. Here, the breakfast buffet will be served every morning, and there is an honesty bar where you can get refreshing drinks. In this communal room, there is also a large shared kitchen space where it is possible to cook your own diner. 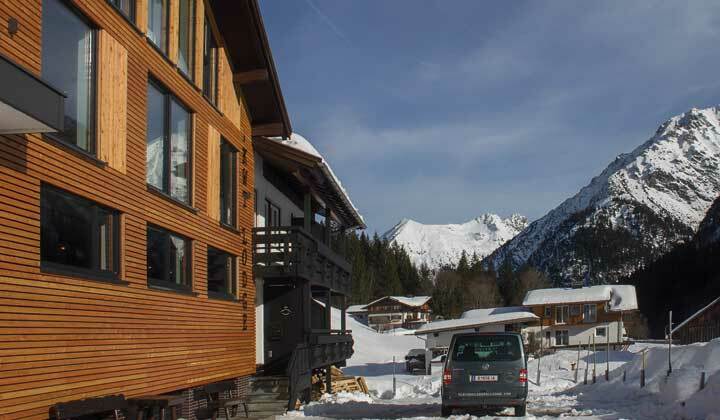 The lodge has a sauna, an outdoor hot tub, a ski room, and a playroom for kids. We are Boaz and Sanne, a Dutch couple who have exchanged the city of Amsterdam for an active outdoor life in the mountains. We are both Wintersport fanatics, and recently decided to move to the Kleinwalsertal in Austria. An easy decision, as we've been coming to Kleinwalsertal since our youth. Since the beginning of July we moved to Baad and we bought the lodge since the 4th of October. We decided to document this process by filming our emigration, settling down in Austria and the rebuilding, for those who are interested to follow. The language we speak is in Dutch, but you can definitely enjoy the nice scenery's of Kleinwalsertal!